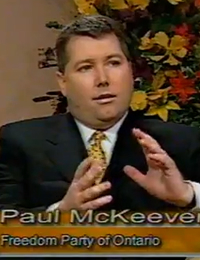 On February 21, 2000, Paul McKeever (Freedom Party of Ontario) was a guest of Rhonda London Live. In this episode, McKeever discussed with host Rhonda London a Toronto report showing the number of hate crimes increasing in the city, and another suggesting an increase across Canada. Rhonda asks: “Is the Canadian model of multiculturalism working, and is this the best tool for fighting racism?”. Also a guest on this episode: Suwanda Sugunasiri (Author of “How to Kick Multiculturalism in Its Teeth”) and Moy Tam (Canadian Race Relations Foundation). Featuring: Paul McKeever (Freedom Party of Ontario), Suwanda Sugunasiri (Author of “How to Kick Multiculturalism in Its Teeth”) and Moy Tam (Canadian Race Relations Foundation).